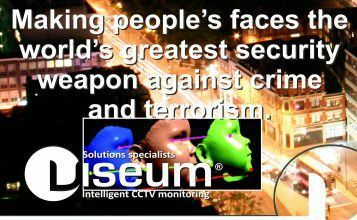 There are 4 main Viseum iVOS FaceRec face recognition software Product Solutions designed to help prevent crime and terror. Also used to investigate crime after an incident, iVOS face recognition software helps deliver the world’s best security services. 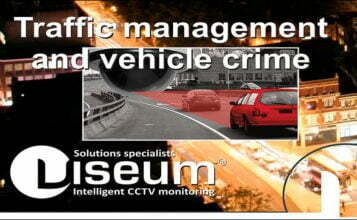 The use of Viseum’s facial biometrics and analytics technology is also fully compliant with the use of image management and image sharing under the UK Data Protection Act 1998.
iVOS VAPR (Viseum Automated Person Recognition) uses the most up-to-date and uniquely intuitive face recognition software to identify facial features and match them with the features stored in relevant suspect databases. Most people have heard of automated number plate recognition (ANPR): this now brings that recognised and well-used system to the detection of human beings. 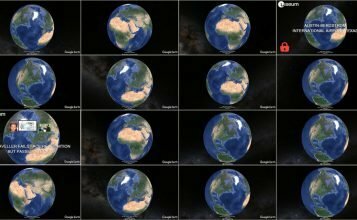 AntiSocial Watch | ATM Watch | Border Control Watch | Bus Watch | Car Watch | Casino Watch | Club Watch | Events Watch | Festival Watch | Hospital Watch | Hotel Watch |Immigration Watch | Missing Person Watch | Plane Watch | Pub Watch | Rail Watch | Shop Watch | Shopping Centre Watch | Stadium Watch | Surgery Watch | Taxi Watch. 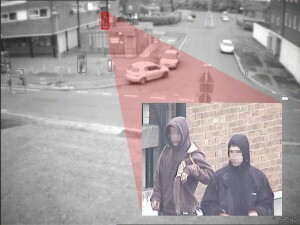 The iVOS camera captures images and identifies facial images. If an incident occurs, the system temporarily stores the image on an iVOS database for possible future use, while simultaneously comparing the newly collected facial image with those held on relevant databases – in the case of crime prevention these will be mainly ‘Suspects’ databases of wanted or unsuitable persons. The system’s matching capabilities are effectively instant and when a positive match occurs an alarm is automatically issued to either a control room or to an individual on a hand-held device for them to take appropriate action. Specific procedures are in place for the addition of facial images to, and their removal from, the iVOS FaceRec database(s). The system is totally transparent to those whose images are being captured and all relevant information readily available as required by data protection legislation. Vis-Seek has been identified for many applications including vehicle immobilisation and ATM security check of matching the facial image taken in the car or at the ATM with a pre-registered image. If the match is successful then the car will not start or the ATM will retain the card for investigation. Vis-Search is used to search specific databases ‘post-event’ using images collected as part of specific evidence gathering. This useful tool uses stored images in databases to match persons captured in ‘evidence CCTV’ and therefore does not need to rely on police officers’ local knowledge or individual memories and so allows post-incident identification to be carried out in a structured and strategic manner. Fully compliant image sharing under the data management of iVOS FaceRec. This allows images to be collected, stored in suitable segmented central databases and distributed to local databases with all the necessary procedures and documentation. Databases may be central, local, distributed, networked, standalone – whichever is required to obtain the best results to meet operational requirements. With recognised standards for CCTV compliance with data protection for images – iVOS FaceRec ensures that areas of privacy, human rights and data protection are fully complied with. For example, in many currently-operated PubWatch schemes personal images are distributed to various locations, whether or not the person might visit these premises. However, iVOS FaceRec ensures that the stored images are only activated when and where required. These 4 core iVOS FaceRec products may be utilised using various image capture methodologies integrated throughout the iVOS FaceRec range of services and products. Clients’ own CCTV cameras may be used depending on the current CCTV compliance level with regard to data protection legislation. iVOS FaceRec is able to provide a range of image capture devices for specific needs with the capability of the 4 core iVOS FaceRec products e.g.